The proposed Orca Protection Act, which was declared dead last week in the Washington State Senate, has sprung back to life with the addition of a budget provision that offers a new chance of passage. The newly resuscitated bill, approved by the Senate Ways and Means Committee, is nearly identical to the original bill, which includes special protections for the endangered Southern Resident killer whales. If approved by both houses, the legislation would impose new restrictions on boaters and drone pilots, increase on-water patrols by state law-enforcement officers and support studies regarding what people can do to save the whales. The original legislation died on Feb. 14 when the Senate failed to approve it before a deadline passed for bills that had no budget impact, as I described in Water Ways last Saturday. The bill was revived this week when its sponsor, Sen. Kevin Ranker, D-Orcas Island, used a procedural maneuver to add a new budget provision. Specifically, Ranker proposed a $5 increase in the cost of special vehicle license plates that depict endangered species, including orcas. The extra money would be used by the Washington Department of Fish and Wildlife for marine patrols and other orca-related activities. Dave Pringle, Democratic policy analyst who works closely with Ranker, told me that the senator heard support for the maneuver from fellow legislators who wanted a chance to vote on the bill. Ranker expects it to pass the Senate with strong support from fellow Democrats as well as a number of Republicans. Action on the Senate floor could come next week, when the bill would move on to the House. The bill describes the 76 Southern Resident orcas as “critically endangered” with a population falling to a 36-year low. 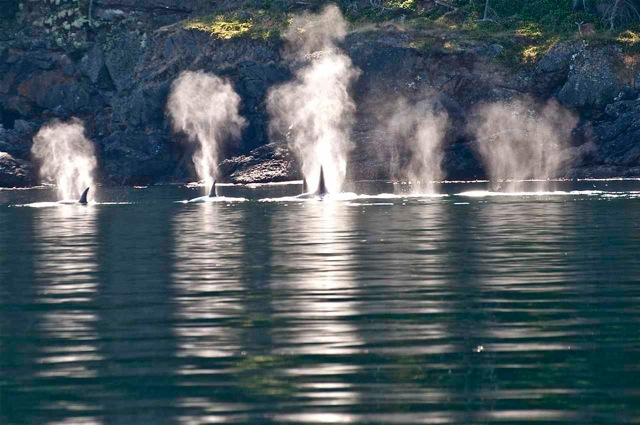 The whales are important to the ecosystem and to the culture of Washington tribes. The Southern Residents also provide the foundation of a $60-million tourist industry, according to the bill. The legislation calls for at least 100 law-enforcement patrols during whale-watching season. Remotely controlled aircraft, known as drones, would not be allowed to come within 200 yards of any Southern Resident orca — which is the same limitation for vessels under existing law. The bill also would require vessels to slow to 7 knots within 400 yards of a whale. Current law has no speed limit. The revised bill adds an exception from the requirements for distance and speed when vessel operators cannot tell that they are too close to the whales because of fog, rain or other weather conditions. The bill also would require the Department of Fish and Wildlife to make recommendations about what further actions could be taken by the Legislature and state agencies to help restore the orca population. It also calls for meetings and collaborations with wildlife officials in British Columbia to discuss protecting and restoring the orcas.